The Raiders were among the most dominant offensive lines in 2016, but that changed drastically in 2017. All four returning starters graded out worse in 2017 than they did in 2016. There’s no denying the talent is still there though, as only left tackle Donald Penn checks in at over 30 years old this season. A lot will come down to how quickly rookie right tackle and first-round pick Kolton Miller can assimilate. 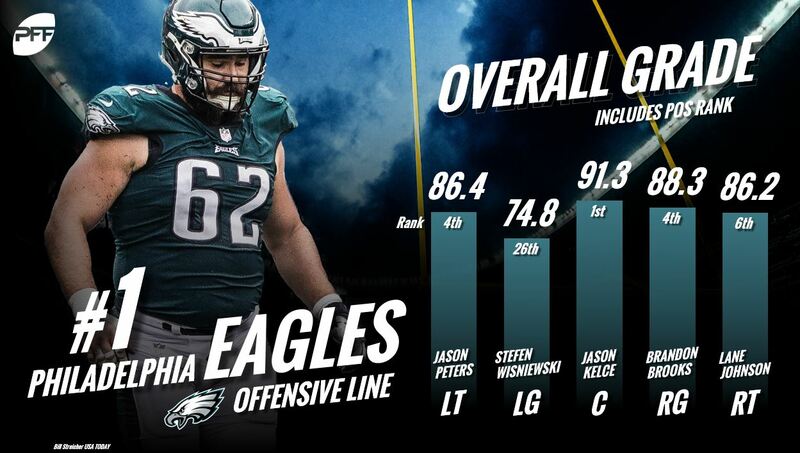 PFF had Miller as our seventh-ranked tackle in the class and a third-round grade. The Lions have quietly built an offensive line that could be the best Matthew Stafford has ever played behind. After signing right guard T.J. Lang and right tackle Rick Wagner last offseason, the Lions drafted PFF’s top-rated college center, Arkansas’ Frank Ragnow, in the first round this April. Now with Taylor Decker a year removed from a torn pectoral, the Lions have a chance to throw out five quality starters for the first time in a while. What the Packers have – when healthy – that few in the NFL can boast are a pair of bookend tackles that you feel comfortable putting on an island snap after snap. No chips or slides necessary, David Bakhtiari and Bryan Bulaga are as good as it gets in pass protection. 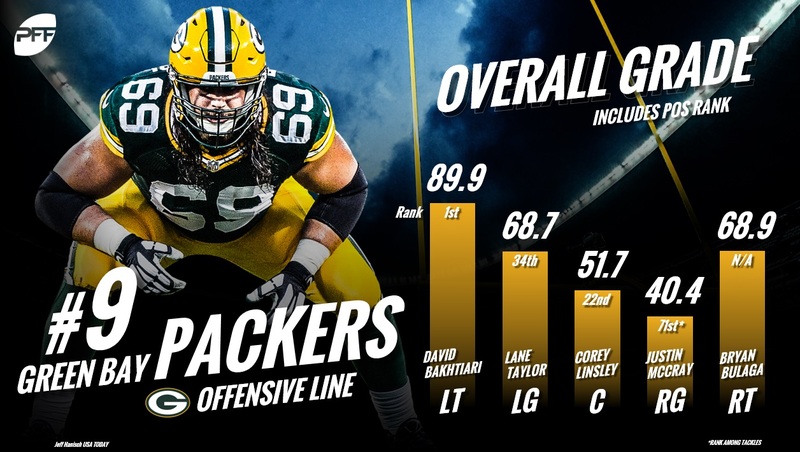 Bakhtiari was the highest-graded left tackle in pass protection this past season (90.5) while Bulaga earned the highest pass protection grade of any right tackle his last healthy season in 2016 (89.3). They have a glaring hole at right guard, but do hold a handful of possible options who could step in there. 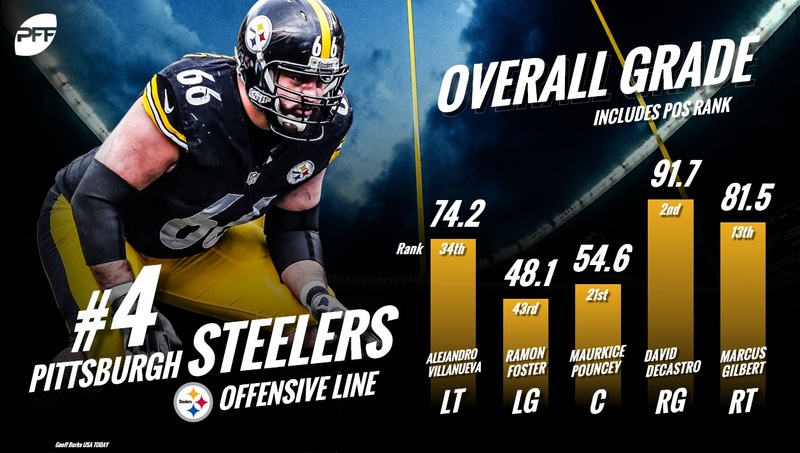 The Rams offensive line was arguably the most-improved unit in the NFL in 2017 after the additions of left tackle Andrew Whitworth and center Jon Sullivan. How long they’ll remain at that level remains to be seen though as Sullivan turns 33 this year and Whitworth 37. Whitworth already showed signs of slowing down late in the season as his Wild Card performance against the Falcons was the lowest-graded game of his entire career. While the interior for the Patriots is solid, the big questions come at tackle. Marcus Cannon is coming back from an ankle injury that placed him injured reserve last year and has only one season graded above 80.0 in his career. Trent Brown on the other hand is currently penciled in at left tackle after having spent his career in San Francisco on the right side and only cracking an overall grade above 70.0 in 2017. First-round pick Isaiah Wynn could be the dark horse here to win the starting left tackle job as he allowed all of four pressures last season at the position for Georgia. 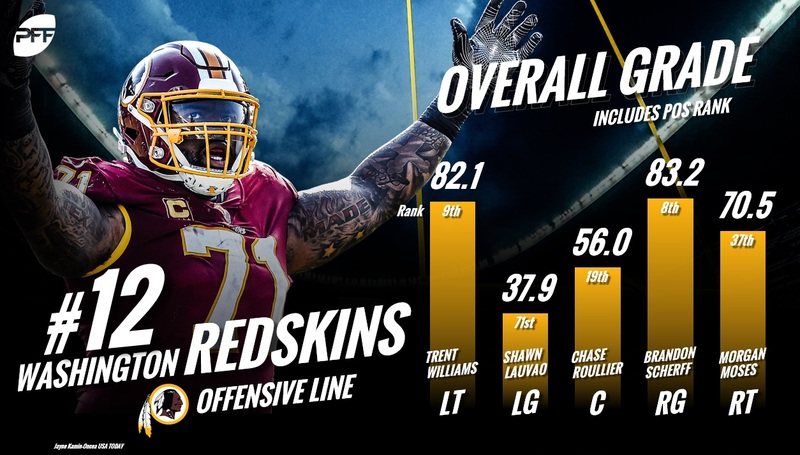 Injuries absolutely ravaged the Redskins offensive line in 2017, but this was one of the best lines in the NFL prior to last year. The two names to watch here are center Chase Roullier and right tackle Morgan Moses. Roullier was one of our favorite sleepers in the 2017 draft out of Wyoming yet only earned a 56.0 overall grade as a rookie in 457 snaps. Moses on the other hand had established himself as one of the best right tackles in the game before taking a step back with a 70.5 overall grade last season. They’ll need both at their best to crack the top 10 this year. The Browns have slowly built one of the best interiors in the NFL, but after the departure of Joe Thomas, they have some glaring question marks at tackle. Shon Coleman was the weak link on the line at right tackle a season ago, allowing 64 total pressures on the season. He’ll now be asked to flip to the left side – no easy task. If that doesn’t work out, left guard Joel Bitonio or second-round pick Austin Corbett could be asked to fill that role. On the right side, the Browns signed former Steelers backup Chris Hubbard to fill the void. He’s played all of 1,238 snaps in his five-year career, but filling in for injuries over the past two seasons he’s yielded all of 39 pressures in 673 pass-blocking snaps (about a season’s worth). 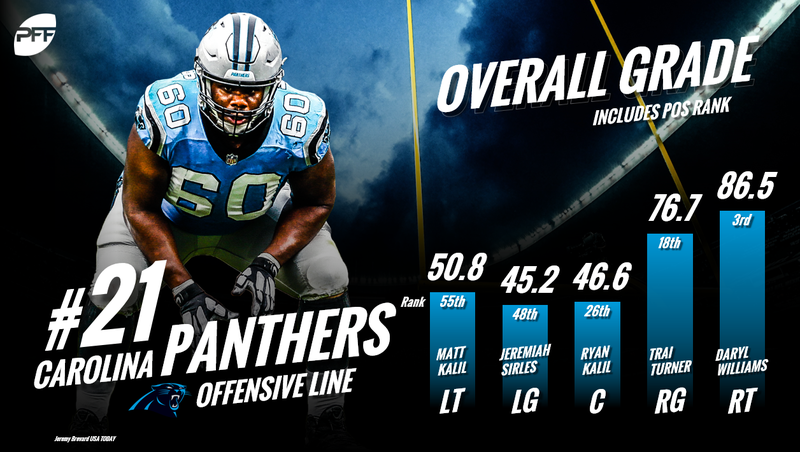 Jacksonville made the splash signing of the offseason when the inked Andrew Norwell – PFF’s third-highest graded guard in 2017 – to a 5-year, $66.5-million deal. That doesn’t completely alleviate the holes in the lineup though as Cam Robinson (37.6 overall grade) and A.J. Cann (52.5 overall grade) are still penciled in at left tackle and right guard, respectively. Robinson will have to make huge strides from a rookie campaign that saw him finish 47th out of 55 qualifying tackles in pass-blocking efficiency. Of all the teams on the list, the 49ers have some of the best potential to outplay their current ranking. The reason being unfulfilled potential. Laken Tomlinson and Joshua Garnett are both former first-round picks who have yet to fulfill their potential. Tomlinson took huge strides forward though last season with a career high 70.7 overall grade while Garnett never got to build on a disappointing rookie campaign (39.6 overall grade) as he missed all last year with a knee injury. Both were highly touted by us here at PFF coming out of college as well. 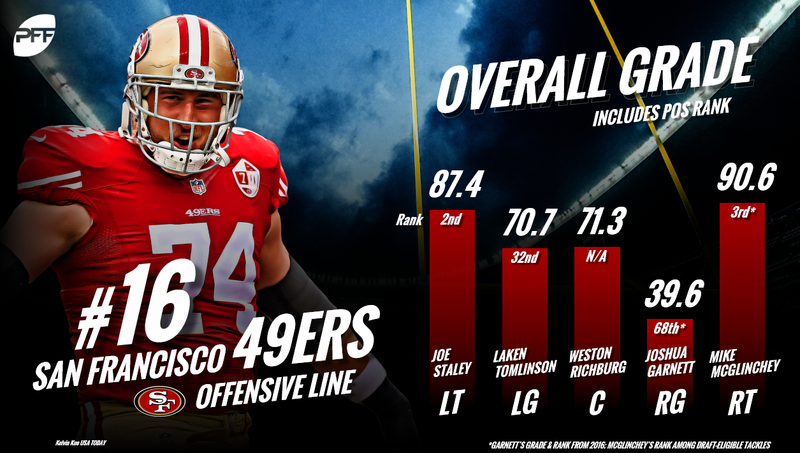 Then you add Weston Richburg – who earned an 86.5 grade back in 2015 – and Mike McGlinchey – PFF’s top-rated tackle in the 2018 draft. There are a lot of unknowns for the Colts up front, but for the first time in a long time, at least there’s hope. Quenton Nelson plugs in immediately at left guard and all signs in his college evaluation point to him being a quality, if not Pro-Bowl level starter immediately. The wildcards here are former high draft picks Ryan Kelly and Jack Mewhort. Mewhort looked well on his way to becoming one of the best guards in football before injuries struck and he was limited to only 979 snaps over the past two seasons. Kelly was solid as a rookie, but he too battled injuries this past year and floundered to a 39.9 overall grade. At least now they have second-round selection Braden Smith as depth in case injuries strike again. The Chiefs are the definition of a solid, if unspectacular, unit. Mitchell Schwartz is one of the best right tackles in the game – earning an 80.0 overall grade last season – but pretty much everyone else on the line is right around average for their position. That gets the job done in today’s NFL though where oftentimes a line is only as strong as its weakest link. The Broncos have suffered through arguably the worst right tackle situation in the NFL over the past two seasons, but there’s reason to think that will change in 2018. Jared Veldheer was a mess early last season in Arizona switching from the left to right side. He allowed only 20 pressures though in his last 10 games in 2017 after allowing 19 in his first three. That late-season play is more in line with the Veldheer we’ve seen throughout his career and could be the answer to the Broncos pass protection woes. The guard position in Miami has seemingly been cursed for some time now. Last year, the revolving door of Jesse Davis, Jermon Bushrod, Ted Larsen and Anthony Steen combined to give up 69 pressures (the average guard duo allows 62). There’s reason to think that number could drop drastically now though with the addition of Josh Sitton who’s allowed only 60 pressures over the last five seasons, combined. The loss of Mike Pouncey might not sting as much as his reputation might suggest as well. New center Daniel Kilgore actually graded higher than Pouncey a season ago, albeit barely (51.0 vs. 46.5). The loss of Norwell is going to hurt. While the backup plan currently looks like some combination of Jeremiah Sirles (45.2 overall grade in 2017) or Amini Silatolu (40.5), it will be interesting to see if they kick Taylor Moton into guard eventually. He was one of the highest-graded guards in the country as a junior for Western Michigan before switching to tackle as a senior. Moton was also one of PFF’s favorite offensive linemen in last year’s draft yet saw only 70 snaps as a rookie. The signing of Ryan Jensen could pay big dividends off for Tampa Bay as it not only adds a quality starter to the lineup (Jensen earned a 74.9 overall grade last year), but it also moves Ali Marpet back to his more natural guard position where he had a career year in 2016. The issue here is still left tackle Donovan Smith. Last season was the first in which he didn’t allow 50-plus pressures and yet was still below average by allowing 42. There is a lot of projection here with Dan Feeney and Forrest Lamp in Year 2 as well as Mike Pouncey, but it’s impossible to think things could get worse. Kenny Wiggins allowed the most pressures of any guard in the league last year (41) while Spencer Pulley allowed the most of any center (38). Simply getting those two out of the lineup has to be worth something. The fate of the Ravens line falls in the hands – or more accurately the ankle – of Marshal Yanda. The future Hall of Famer has been unquestionably the best guard in football the past few years, but without him, Joe Flacco turned into a gun shy, checkdown artist last year. Turning 34 in September, there’s no certainty that Yanda ever returns to form. After making Nate Solder the highest paid tackle in football and drafting Will Hernandez in the second-round, the Giants offensive line has to be better than last year. Neither of those guys are sure-fire miracle workers though as Solder himself gave up 51 pressures a season ago (Ereck Flowers has averaged 58 a season for his career). The Bengals still ranking 26th after the addition of left tackle Cordy Glenn and first-round center Billy Price should tell you all you need to know about how bad they were a season ago. For as much of an upgrade as Glenn will be, there is no certainty Price will be the same. He had a third-round grade from PFF and his struggled in pass protection with 13 pressures allowed last season. This group will look much different than the 2017 version – which can’t be a bad thing. The only problem is that this group – more than maybe any other in the NFL – has serious injury concerns. Almost every starter has missed significant time in each of the past two seasons and the Cardinals don’t exactly have quality depth to make up for it. If Mike Iupati, Justin Pugh and Andre Smith all return back to their career-best form, this could be a top-10 group. The odds of that happening, or even them playing all 16 games, seems incredibly slim after all the injuries they’ve suffered. While the Vikings line certainly made strides in 2017, Case Keenum was still the third-most frequently pressured quarterback in the NFL. After investing heavily in it last offseason, their starting five may very well remain status quo heading into 2018. The only likely change is if second-round pick Brian O’Neill can win the starting right tackle job. Based on his 1-on-1 performances at the Senior Bowl though, where he won only 27 percent of his reps, he may not be NFL ready anytime soon. The Bills have about as much to replace talent-wise as any offensive line in the NFL. That’s what happens when you lose your top-three starters (LT Cordy Glenn, LG Richie Incognito, C Eric Wood) along your offensive line (although Glenn only played 275 snaps this past year). Outside of rookie Dion Dawkins – who performed admirably with a 74.5 overall grade as a rookie – there’s not much room for ‘upside’ among their potential starters. 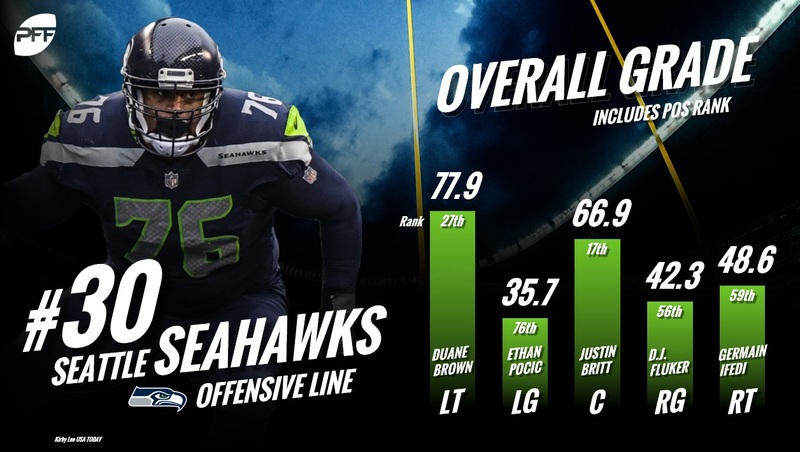 Duane Brown at least brought some semblance of competency to the Seahawks line towards the end of last season. Prior to the trade, the line had a pass-blocking efficiency of 71.5, while afterwards that number jumped to 78.4 (right around league average). The right side of the line is still ugly though as D.J. Fluker and Germain Ifedi had pass-blocking grades of 32.4 and 71.5 last year, respectively. While the Jets may not end up 31st at season’s end, this ranking is more indicative of the little room for optimism along the front. If there is any silver lining though it’s that things can’t get any worse for them at center than they were last year. Wesley Johnson’s 31.3 grade was one of the lowest we’ve ever given at the position. For all of new-center Spencer Long’s struggles last year, there’s no doubt he’ll be an upgrade. After fielding one of the worst offensive lines we’ve seen in the PFF era, there’s little reason to think they’ll rank anything other than 32nd again this upcoming season. While injuries certainly played a role – and it’s likely center Nick Martin could bounce back from an ugly 44.9 overall grade last season – they’ve pinned their hopes to other team’s castoffs and a fourth-rounder from 2017 to protect Deshaun Watson.